Josh Wussow is a freelance writer, reviewer, and the questionable mind behind JourneywindJunk, a blog that EveryDayCommentary calls "smashingly fun to read." His more respectable work is published over at GearJunkie, as well as here on BladeReviews. See what he's up to on his Instagram page, @JourneywindJunk. After years of choosing timepieces based on their durability, it’s finally happened – I find myself in need of a dress watch. While 200-meter monsters like the Casio Duro and Victorinox INOX still rule my days, there’s now the occasional evening which calls for something a bit more refined. I’d previously owned an Orient Bambino, a $130 mechanical bought and sold long before the need arose for tucked shirts and nice shoes. Fond memories of that watch brought me to the Orient Esteem Gen. 2, an open-heart automatic with a classic look and pedigree. Here’s how it fared after several months of testing. As someone with medium-sized wrists, the numbers that jump out most are the case width and distance lug to lug. These dimensions make for a dress watch that’s slightly on the larger side, both in wear and visual signature. We’ll get to the Esteem’s dial later, but there’s no denying the amount of white space in that 40-plus millimeter circle. If you’re planning to wear this watch to a fancy dinner party, be prepared to pick a suit that matches. That being said, the watch does wear quite comfortably. It’s relatively thin for a budget-minded mechanical, sliding easily under the cuff of a shirt or jacket. I enjoyed the tactile sensation of the Esteem against my wrist, so long as my hand was on the table or at my side. The Gen 2 Esteem is powered by Orient’s in-house Caliber F6T22 movement, a 22-jewel automatic assembly featuring the ability to hack and hand-wind. These are must-have features for me, no matter how loud the Seiko fans protest (I’m looking at you, 5 Series and SKX apologists). One of the main selling points of this watch is the open-heart design, which gives you a glimpse of the F6T22 in action. We’ll talk more about appearances later, though. For now, I’d to say a few words about the movement’s performance. “Inaccurate, inconsistent, and scratchy.” Yeah, those just about cover it. Look, I’m not expecting masterful performance from an entry-level mechanical. My other Orients (the Mako 2 and Bambino 2nd Gen) both ran about 10 seconds fast per day. But the Esteem ticks ahead to the tune of 15 seconds on the wrist, and as much as 20 in my watch drawer. The movement can be regulated for increased accuracy, as demonstrated by the “+” and “-“ symbols visible through the clear case back. But out of the box, this was something of a bummer. My frustration with the Caliber F6T22 is exacerbated by the roughness of its winding. Turning the crown produces some rather harsh feedback, even more so than the Bambino. The rotor has a similar problem. Every swing of your arm sends the scratch of its arc into the bones of your wrist. At no point will you forget you’re wearing an automatic. That being said, I don’t think there’s anything mechanically unsound about the movement’s construction. It’s just the nature of lower-end autos. I also find myself missing the date window. As someone who needs to know the date more or less constantly for work, I pine for the Bambino’s simple 1-31 display. The idea that people spend thousands of dollars on date-free watches boggles my mind. Maybe when I’m rich enough to afford one, I’ll understand. But until I reach that point, I need to know my days of the month. The Esteem’s case is nicely beveled, polished, and finished. Sure, it’s a bit large for my liking, but that doesn’t detract from the quality of its construction. There’s no brushing to be found anywhere. Every metallic surface reflects my face like a funhouse mirror. The crown is simple, unsigned, and easy to use. The ridged grip is perfect, and the push/pull feel is solid. I have no reason to doubt its claimed 5-bar (50m) water resistance, though the leather band will probably keep this particular piece out of swimming pools. Speaking of the water resistance, let’s flip to the back of watch. That’s where you’ll find it printed, along with data on the movement’s origins and manufacturing details. But why take the printer’s word for it? Orient has included a clear case back, allowing you to see the action for yourself. I especially appreciate the etching on the rotor, with its interesting angles surrounding some additional branding. The visual interest of the movement almost makes up for its relatively poor accuracy. Almost. Let’s turn the watch back over and examine the face. Wait, what are those hollow rectangles above the hour markers? And why are the hands hollowed out? As it turns out, the Orient Esteem is part of a rare breed: A dress watch with lume. While certainly no Super-LumiNova, the applied compound will make for a smooth transition from the brightly-lit ballroom to the more intimate glow of the balcony. Speaking of applied things, take a look at the logo. The twin lions are in fine form here, mimicking the look of the Orient Mako, Ray, and Bambino. Unfortunately, that’s where the Esteem begins to dress down. While the Bambino features applied indices and a date window, this watch is left with painted numerals and a massive amount of white, empty space. It’s more off-putting in person than the photos perhaps convey, which is why I didn’t notice before pulling the trigger on the purchase. “Hold on,” you might say. “You’re missing the entire point of the Esteem’s ethos. Just look at that beautiful open-heart movement.” And you’re right – The window into the watch’s inner workings is really a sight to behold. The nicely polished components spin and click behind the sweeping seconds hand, showing the complexity to be found even in a basic, dateless movement. Too bad about the 9 o’clock marker, though. The numeral is partially cut away, creating this awkward reminder that the indices are simply painted onto the watch’s face. It’s a visual bummer, nagging at me every time I stop to enjoy the movement window. Let’s round out this segment with a few words on the crystal. It’s Orient’s standard mineral glass, which served admirably on my Bambino. Here, however, the dome effect has been flattened considerably. There’s still a bit of rounding above the polished steel bezel, but nothing near the lens-like quality of its cousin. I actually prefer this approach. It’s easier to read at an angle, and the flatter surface will probably avoid scratches more than the Bambino’s bubble. The Esteem’s leather band addresses another of my biggest annoyances with my previous Orient dress watch. While the Bambino features an oddball 21mm size, the Esteem has bumped things up to the much more common 22mm. This greatly widens the pool of potential replacement straps. That is, if you feel the need to make a switch. The black “Genuine Leather” seems nice enough for a watch in this price point, and the signed buckle makes for a nice touch. I found this to be a thoroughly comfortable wearer. Additional break-in time would further improve the experience, softening the crocodile-patterned canvas. After more than two months, I still haven’t warmed to the Esteem. It addresses several of my main complaints with the Bambino (hidden movement, no lume, and weird band size), but adds several nitpicks of its own. The spotty accuracy, plain face, and absent date window stick in my craw more than expected. Add in the slightly larger size and scratchy movement, and I find myself pining for the old days. That’s not to say that this is a bad watch. It’s light years ahead of the Seiko 5’s of the world, whatever my complaints may be. But as the unnumbered days roll on, I’ve come to the conclusion that this isn’t the watch for me. My search for the perfect budgetary dress piece will continue. However, none of this means that the Gen. 2 Esteem is a terrible timepiece. If you see what you like here, then I can still vouch for its comfort and construction. The accuracy isn’t great, but overall quality I expect from Orient is still here. Editor: I recommend purchasing the Orient Esteem at Amazon or Jomashop. Please consider that buying anything through any of the links on this website helps support BladeReviews.com, and keeps the site going. As always, any and all support is greatly appreciated. Thank you very much. Also, if you like the watch reviews, here is a link to all our watch reviews. Alright, I’ll admit it – I’m a huge fan of ESEE Knives. I own a Candiru, Izula-2, and JG3, and I’ve had the pleasure of reviewing an exquisite PR4. So, when the opportunity to sample their Laser Strike model landed in my inbox, you can guess the speed of my reply. While I’m hardly alone in this enthusiasm, much of the halo surrounding ESEE comes from inside the blade-enthusiast bubble. Their American-made pedigree and bulletproof warranty are great for nerds like me, but what about the regular folks who buy their camp knives at Walmart? Tell them you spent $115 on an outdoor blade, and they’ll shoot you some pretty strange looks. Don’t drink and play with knives, kids. Now, onward before that stuff kicks in. In a brand known for its rugged offerings, the Laser Strike stands out as a damage-duty champ. You’re looking at 10-inches of full tang 1095 carbon steel, with a blade nearly as thick as three US quarters stacked together (0.188-inches). The blade length is a rangy 4.75-inches, 4.5 of which are sharpened. Its flat grind features ESEE’s rugged “Black Textured Powder Coat” over a 1.38-inch width, broken only by the maker’s marks. The knife’s total weight is 9.5-ounces, which is around half as much as a youth-sized aluminum baseball bat. Now, let me be clear about the provenance of this particular tool. ESEE was kind enough to send it to notorious Youtuber and (I’m directly quoting him here) “big piece of doo doo” Advanced Knife Bro, who agreed to send it my way after mercilessly pummeling it. As expected, the blade arrived in need of some love. But, that’s one of the beauties of 1095 – It’s easy to whip back into shape. A quick cleaning and Sharpmaker session were all it took to bring the edge back to shaving sharp. But, with a pile of firewood in the garage and a camping trip on the horizon, it didn’t stay that way for long. Surprised? I certainly was. While it’s certainly no santoku, the Laser Strike turned out to be a more than adequate prep tool. And this was after I’d batoned through several pieces of damp firewood. You won’t be producing translucent onion slices, but for rustic fare like this, the ESEE is surprisingly adept. I love the way that ESEE’s tend to hold my hand. Is that creepy? Too bad, the statement stands. The company’s canvas micarta is on point, and the forward choil fits my index finger perfectly. I also enjoyed the widely spaced jimping, positioned at the step-down transition from blade to handle. It provides excellent traction for my thumb without any discernable discomfort. A quick aside, for the sake of comparison: I took several knives on this camping trip, including my beloved L.T. Wright GNS and the Condor Swamp Romper (which I gave away to a buddy who didn’t know any better). I encouraged my friends to handle each blade, and the Laser Strike’s scales were the runaway favorite. This could be considered anecdotal, sure, but it was interesting to get some perspective from folks who’re just getting into the knife hobby. Now, let’s take a moment to discuss the stuff inside the handle. See that metal washer hanging from the base of the sheath? Well, it’s not just for show. This metal disc acts as a flathead driver, allowing you to remove the handle scales. Stowed within are a fire steel and a couple tinder pellets, all included as part of the overall package. This further pushes the Laser Strike’s “Survival Knife” image, though I do have a few qualms. While certainly serviceable, this small fire steel is pretty difficult to spark. And, given the powder coat, the only available striking surface is (shudder) the blade edge. Sure, the sharpening choil might work, but I’d need to be in a real-life “Fire or I perish” sort of situation before doing that much damage to the cutting surface. The Laser Strike has another option built in. See that divot on the right handle scale? That’s for a bow drill, allowing you to make fire in an even more bushcraft-friendly fashion. Inefficient? Sure, but 100% cool. The Laser Strike ships with a black Kydex sheath setup, including an ambidextrous clip plate and the aforementioned lanyard/washer combo. It’s a far cry from the leather of the Camp Lore knives I’ve been testing, falling more into the ESEE’s number-knife family (3, 4, 5, etc.). Retention on the Kydex is good, though it’s absolutely possible to shake 9.5 ounces of knife out of its grip with enough downward thrust. Tension can be adjusted using the sliding screw and washer above the choil area, so you can tighten things up if you feel the need. I like ride height, despite my usual preference for leather danglers. It also manages to be fairly slim, making the knife carry much easier than one would expect from a blade of this heft. Going into this review, I had no doubts about the Laser Strike’s capabilities as a field-first tool. But it impressed me in every application, from batoning to carving to cooking. Expectations aside, part of the joy of this particular test came from the look on my friends’ faces as they watched me hammer it through our firewood, and the smiles when I handed it over and said “Give it a shot.” Being able to follow up with “You’re not going to break it” and watching them realize it was true – Man, that was a neat moment. Sufficed to say, I’m completely sold on the Laser Strike as a heavy-duty hacker. It’s not going to replace your smaller blades for ultralight outings and day hikes, but it’s a super-solid addition to a hard-use loadout or car camping kit. Thanks again to ESEE Knives and Advanced Knife Bro for allowing me to check it out. Editor: I recommend purchasing the ESEE Laser Strike at Amazon or BladeHQ. Please consider that buying anything through any of the links on this website helps support BladeReviews.com, and keeps the site going. As always, any and all support is greatly appreciated. Thank you very much. The Platinum 3776 Century sits at an interesting crossroad in my personal gear journey. Drawing its name from the elevation of Mt. Fuji, it embodies several things I enjoy: Japanese craftsmanship (in food, tools, and monster movies), writing (especially with fountain pens), and wine (reds, in particular). Given that it came along at the peak of my interest in nibs and ink, we were bound to wind up together. So, how much does all this serendipity cost? Get ready: 180 American dollars. Now, I didn’t pay anywhere near that. This particular wine-red model (known as the Bourgogne) cost me almost a century less – Just under $80 on Amazon. Here’s my full review of the Platinum 3776 Century after more than six months of use. If I was asked to close my eyes and picture a fountain pen, my mind would conjure up an image very much like the Century. Its rounded cigar shape, translucent resin, and tasteful branding all fall into the comforting realm of clean-cut familiarity. Pen dimensions! Here we go: The overall length of this mental picture is 5.5-inches with the cap screwed into place, or 6.3 with it posted and ready to write. The diameter of the grip area is 0.4-inches, with the body widening out to 0.5. Overall weight is a scant 0.7 ounces, excluding the minimal heft of the ink. Speaking of which, the pen’s liquid capacity varies depending on your fill method: 1.27-miliiters for Platinum’s proprietary cartridges, or 0.82ml with the converter. Let’s dive into some of the details. Take a look at the ring around the base of the cap. It reads, “#3776 PLATINUM – MADE IN JAPAN.” There’s another logo and symbol in there, but the overall effect of the printing and text is very nice. I enjoy the little gold rings on the cap and body, too. They really pop against the wine-red resin, creating a premium look in just about any light. The same is true of the clip, which is polished enough to give off a reflection reminiscent of a funhouse mirror. The nib, too, is nicely detailed. You’ve got a pair of mountainous-looking lines above a heart-shaped breather hole, and more tasteful branding. And see that “14K” mark? That’s right – This is a real-life golden nib! We’ll come back to its function later, but Platinum nailed the form factory with this pen. The care shown in the Century’s design caries over from the visual to the tactile. The smooth texture of its burgundy surface is welcoming to the hand, and its forward grip section offers just enough purchase for my medium/large hand. The threading can be a touch sharp if your fingers back out of position, but the overall ergos are strong. But here’s the Century’s party trick: See that spring assembly inside the upper portion of the cap? That’s Platinum’s patented “Slip & Seal” mechanism. It creates a seal inside, restricting air flow to the nib. This, if you believe the marketing literature, will help keep that 14-karat tip inked for up to 24 months. Obviously, I haven’t been able to fully vet this claim. But I can tell you that, even after a month of rest in my pen case, the Century has yet to give me a dry start. I’m inclined to give credence to the better part of Platinum’s claim. After examining the pen from cap to post, it’s time to get to the point. Specifically, we need to talk about that fancy gold nib. For all its beauty and detail work, it’s not that great of a writer. Disappointing, right? But, let’s add a little color to this dreary statement. First, I should clarify by saying that it’s still a more pleasurable writer than any ballpoint, rollerball, or gel pen in existence. The Diamine Blue Velvet ink flows nicely from the medium nib, with a good amount of color shading in its lines. It should be noted that, as with most Japanese pens, their “Medium” size is akin to a “Fine” nib from other manufacturers. But the problem here isn’t in the pen’s ability to lay down lines – It’s the AM-radio static it sends coursing up from the nib and into my hand. The feedback from this supposedly premium writer was so bad, in fact, that I sent the first pen back to its Amazon seller. The replacement that came a few days later was slightly better, but still scratchier than a humble Lamy Safari. On the plus side, this taught me a thing or two about nib tuning. I grabbed some emery boards and micromesh and was able to smooth out the writing experience. But, even after these adjustments, I still can’t use this on my favorite Strathmore letter paper. The rough-ish texture of the stationary doesn’t play well with the Platinum. There’s still some good here, though. While the fine-ish tip isn’t great for premium paper, it somehow pairs well with standard legal pads and notebooks. The feedback is also greatly reduced with my Clairfontaine Triomphe, which offers a much smoother surface. And, while I actually get better line variation with my Faber-Castell Loom and TWSBI ECO, the Century’s shading ability creates some really beautiful visual texturing. A few quick words on filling. While you can always opt for Platinum’s proprietary cartridges, I paid $7 for a converter on Amazon. It’s a simple screw and piston affair, and I’ve had no issues with bottled ink. The Century and I have developed a deep love/hate relationship, more so than any other piece of gear in my collection. I love its look, feel, and style, but the limited writing utility makes it a truly frustrating piece. As such, I can’t recommend this particular pen. Especially not at its $180 retail price, which is absolutely unacceptable. I paid nearly $100 less, and I still feel like I’ve been taken for a ride. An elegant and occasionally beautiful ride, sure, but a disappointing trip all the same. If you’re looking to take your pen hobby to new heights, I’d avoid this Platinum’s particular mountain. Editor: I recommend purchasing the Platinum 3776 Century at Amazon. Please consider that buying anything through any of the links on this website helps support BladeReviews.com, and keeps the site going. As always, any and all support is greatly appreciated. Thank you very much. Few names in the knife world garner as much respect as Jesper Voxnaes and Jens Anso. Together, they’re a veritable dynamic duo of knife design. So, when the folks at Giant Mouse Knives agreed to send over a loaner of the pair’s new ACE Nimbus model, the clouds parted and I beheld the aura of a truly excellent EDC blade. Let’s start with the Nimbus’ centerpiece – Three inches of flat-ground Bohler M390. This beautiful blade is a full inch tall, with a thickness of 0.14 at its well-chamfered peak. The satin finish provides a glow worthy of its namesake’s Merriam-Webster definition, with beautifully etched logos on the clip side. The teardrop opening hole is rounded along its top (where your finger is most likely to make contact), though the lower edge has been left square. Behind the blade, users will be treated to 4.25-inches of textured G-10, with stainless steel liners and a reversable wire pocket clip. The Nimbus is fairly wide through the hips, exactly twice as tall in the handle (1.1”) as it is across (0.55”). This brings the weight to a not-inconsiderable 4.04-ounces – Hefty, but not bad for a heavy-use tool. And indeed, this is how Giant Mouse wants us to consider the Nimbus. They advertise it as “the knife you’ll want to keep in your winter coat, backpack, working jeans or toolbox.” In that vein, here’s a comparison with the two other folders I reach for when the going gets tough: The Spyderco Native 5 and Zero Tolerance 0562. So, how does it perform? Honestly, this one took a while to grow on me. The blade felt undersized at first, struggling to straddle apples and medium sized onions. The turning point came in the form of several large bookshelf boxes from my construction trailer. These paper behemoths fell to pieces in the face of the Nimbus. Its tall edge glided through six-foot swaths of quarter-inch cardboard, almost reminiscent of a razor knife. Consider me sold. Performance aside, there are additional advantages to a sub-3.5 blade, legality being foremost among them. From city warehouses to country cabins, it’s a knife that can go where the work is. A few nitpicks: While I love the cutting capability, I actually feel that the blade may be a little under-branded. The ACE and Giant Mouse logos are great, but the show side has been left completely blank. I’d like to see these split, perhaps with one logo on each side, in addition to a mark announcing the M390 steel. The Nimbus is a nice match for my medium/large hand. The humpback design creates a solid grip, especially when paired with the handle’s overall thickness. The thumb jimping is perfectly placed, just forward of the opening hole. The texturing of the G-10 is sublime, marking a nice balance between smoothness and grip. I’d compare it to the feeling of a Micarta handle from ESEE, making it a bit softer than the G-10 on the ZT 0562 shown above. The weakest point of this ACE’s ergos lies in its lockbar. The slight scallops cut for thumb traction tend to rest in the joint of my index finger, causing a bit of a sawing effect under heavy grip. It’s not a major issue, and just mentioning it makes it sound like more of an issue than it really is. At no point did I develop a skin irritation because of this bit of texturing. Still, you’ll certainly know it’s there. Speaking of touchy spots, take a look at the tip in the photo below. More specifically, check out how close it is to the top of the liners. Yeesh. While it’s not close enough to catch a finger as it slides across the surface, this is my strongest criticism of the knife. A slight alteration in the blade’s angle would have dropped the point safely beneath the surface. As it is, it’s not close enough to be considered a fatal flaw. But you’ll definitely want to mind the gap, as our British friends say. The wire clip, too, is something of a conundrum. While I’m a huge fan of its overall design and deep-carry function, it does create a minor hotspot in the palm. The pros outweigh the cons here, so I’m happy with it overall. Beyond the solidity of its machining, there’s some excellent detail work here. The badging on the liners is very attractive, and obviously meant to be enjoyed by tinkerers such as myself. Then there are the washers, inset with a race track for the bearings. There’s so much to like here, and the disassembly process is relatively straightforward. My lone complaint lies in the free-spinning pivot, which requires a TORX driver on both sides for takedown and dial-in. Otherwise, this knife’s maintenance process was a breeze. Giant Mouse said it best themselves: “If you are looking for a trick knife to middle-finger flick and play with during office breaks, we have other options coming in the ACE-line.” This held true throughout my time with the Nimbus. While the finger hole is certainly capable of producing snappy opens, this isn’t exactly a fidget-friendly tool. For one, the lack of a flipper tab/blade guard makes it possible to flick the edge down onto your thumb during closure. It didn’t happen to me, but careless users may find themselves with a nick or two if they’re not careful. This isn’t something I’d consider as a flaw, especially since Giant Mouse straight up warns you that this is a function-first knife. Still, lockup is solid and satisfying, with the linerlock leaf snapping into place flush with the clip side of the blade tang. Dialing the action in can take a bit after disassembly, due to the nature of a free-spinning pivot. But once you have the screws in right, you’re left with nothing but smooth solidity. The Nimbus looks, feels, and cuts like a $175 knife – Every inch, every penny. From its excellent construction to the thoughtfulness of its design, this is a rare case where the silver linings outshine whatever troubles make up the cloud. Fans of Anso and Voxnaes will find a lot to like here, and newcomers can use it as a primer for their design philosophy. At the risk of making a pun, the folks at Giant Mouse… Well, they ACE’d it. I recommend purchasing the Giant Mouse ACE Nimbus at BladeHQ. Please consider that buying anything through any of the links on this website (including Amazon) helps support BladeReviews.com, and keeps the site going. As always, any and all support is greatly appreciated. Thank you very much. Dmitry Sinkevich and Kershaw are on a roll. Following the success of the critically-acclaimed Atmos, they’re leaping back into service with the Concierge – A slightly larger pocket knife boasting the same sci-fi elegance and everyday accessibility. With an out-the-door cost of $38 at BladeHQ, the Kershaw Concierge is a compelling entry point into the mind of one of the world’s premier knife designers. Its dapper handle houses a deceptively simple blade, ready to trim the foil from your morning champagne or cut the rind from your brie at brunch. I spent a few weeks chauffeuring this knife between work and play, thanks to the generosity of the folks at Kershaw. Here’s what I’ve learned over my stay with the Concierge. The Concierge boasts a contoured, upswept blade some 3.25-inches in length. The stock is rather narrow across the shoulders (0.11-inches), with a hollow grind outfitted in a dapper gray titanium nitride coating. Beneath this lies Kershaw’s ever-present 8Cr13MoV steel. Now, I won’t go too far down the steel rabbit hole, since the similarly equipped Atmos has proven to be a capable worker. I’d still like to see something like 154CM or 14C28N on Kershaw’s budget models, but at least their 8Cr runs better than most. The rest of the Concierge’s 7.25-inches is comprised of nicely crowned G-10, within which lies a stainless steel linerlock and KVT ball bearing system. Think about that for a second – Up until a few years ago, this would almost certainly have been running on Teflon or (if we were lucky) phosphor bronze washers. As it is, this newly affordable mechanism is sandwiched in a 0.55-inch thick handle, bringing the knife’s total weight to 4.3-ounces. Now that we’ve covered the stats, let’s take a minute to talk about the knife’s real-world usage. The long, gentle curve of the blade is well suited for daily tasks. Its hollow grind had no trouble dealing with my typical mediums – apples, onions, cardboard, envelopes, and plastic wrap. The knife came sharp from the factory, and I’ve stropped it back to life with no issues. We’ll cover the details of the ergonomics in a moment, but I’m generally impressed with the everyday ability of the Concierge. This is a knife that’s smooth all over – Like a tactical otter, or a slippery maitre d’. The subtle swells and arcs of the Concierge’s handle are really something to appreciate, especially when examined up close. Dmitry Sinkevich is known for his sleek, futuristic designs, and his style is in full force here. The texturing of the G-10 handles is subtle and smooth. The large, dimpled pivot screws provide an interesting focal point for eye and thumb alike, and the chamfered steel liners are easy on the palm. I appreciate the jimping on the long backspacer, as well. Beyond its ergonomic appeal, it’s another point of visual grace in the knife’s overall design. One of the more unique aspects of the Concierge lies in its recessed pocket clip. This single tongue of steel dips below level of the rest of the handle, thanks to a pair of unique cutouts. The tip peeks just above the horizon of the surrounding G-10, allowing users to slip the knife in and out of the pocket with ease. It takes a bit of practice, but I’m a big fan of the concept here. A recessed clip translates into a reduction of hot-spots in the hand, and Mr. Sinkevich has nailed its implementation. True, this means you’re left with a non-reversible clip. But for the majority of the knife-buying audience, this should be a hit. The Concierge employs some of the best fit and finishing I’ve seen on a sub-$100 blade. But once we transition into the functional realm, several budgetary bugaboos rear their ugly heads. Let’s start with the positives. The opening action is strong, thanks to a solidly designed detent. The blade’s long flipper tab is well-ground and smooth, preferring a button-style press to the old light-switch flick. As mentioned earlier, it’s great to see a KVT bearing system at a price point formerly reserved for Teflon or phosphor bronze washers. So, deployment is a breeze. Stowage, however, is an entirely different story. My particular test model came with some pretty significant lock stick. Even after a thorough breakdown, cleaning, and repeated application of graphite and Sharpie, it’s still not a terribly smooth process. Combine this with the rather thin (though well-chamfered) lock bar, and you’ve got a recipe for tenderized thumb meat. This removes much of the fidget-factor that made the Atmos so appealing. I’ve spent a decent amount of time messing around with the Concierge, and the lockbar hang-up isn’t as bad as it used to be. But, at least on my test model, the stickiness took some of the fun out of the experience. It’s a shame, especially given the KVT bearings and the perfect position of the flipper tab. There’s also an odd note of metallic chatter upon closure, most noticeable between the disengagement of the lock and the blade tang hopping up over the detent. This is a minor issue, and I’m not concerned about the mechanical soundness of the lock system. But, it’s a small annoyance not present on the cheaper Atmos. By this point, my preference should be clear – I ditched the $150 ZT0450 in favor of the Atmos, and the Concierge (while certainly a nice knife) isn’t going to kick its smaller cousin out of the collection. This is largely due to personal aesthetic (I prefer the uncoated blade), but the lock stick comes into play as well. Minor production hang-ups aside, I still think this is an excellent knife. The recessed pocket clip and upscale aesthetic alone are enough to warrant the price of entry. I’d advise potential purchasers to adopt the try-before-you-buy attitude, in order to avoid picking up a model with the same lock stick issue I encountered. But, this is another strong collaboration between Kershaw and Dmitry Sinkevich. It’s a solid option at a respectable price, especially if the Atmos is too small for your palm. 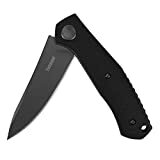 Editor: I recommend purchasing the Kershaw Concierge at Amazon or BladeHQ. Please consider that buying anything through any of the links on this website helps support BladeReviews.com, and keeps the site going. As always, any and all support is greatly appreciated. Thank you very much.